High energy electrons and ions are generated by the interaction between plasma and ultra-high intensity laser exceeding Peta-Watt. We are try to understand and control their generation, transport and energy dissipation in the plasmas. Our mission is to demonstrate plasma heating up to 50 million degrees that is the threshold temperature of the fusion ignition. As a control method, we will proactively introduce new ideas, such as plasma mirrors, kilo-Tesla magnetic fields, etc. 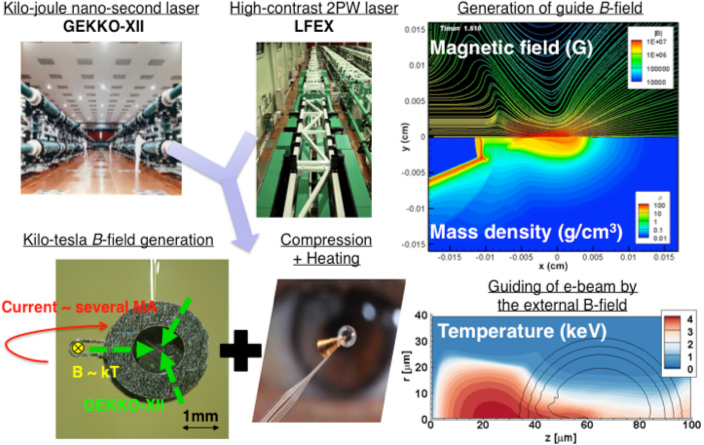 Figure: A high-density plasma is produced by laser-driven implosion with GEKKO-XII laser facility, and the dense plasma is heated by the LFEX laser. Kilo-tesla magnetic field, which is generated with a capacitor-coil target irradiated by a part of GEKKO-XII laser, is applied to the dense plasma to increase heating efficiency. We understand the physics related to the plasma heating based on the experimental results with the help of computer simulation. 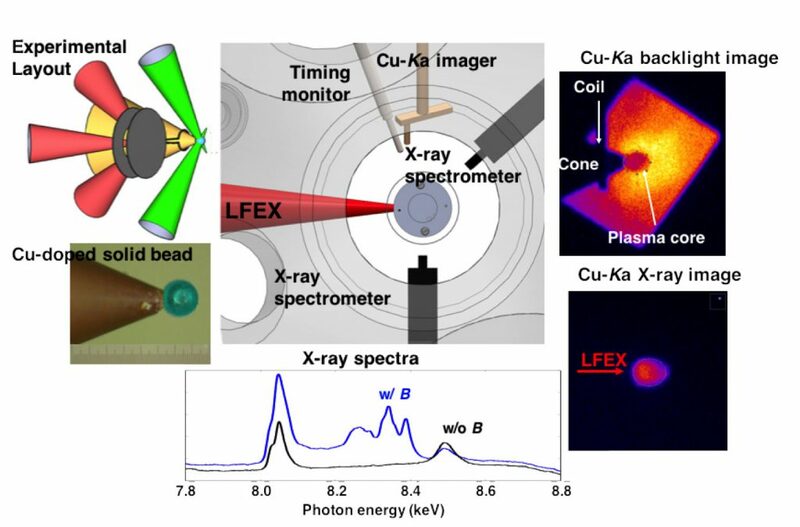 Figure: X-ray imaging ans spectrosocpy and neutron diagnostics are used in fast ignition laser fusion experiment. We will create a wide range of high energy density plasmas to study pioneering extreme plasma physics such as relativistic plasma, high temperature and high density plasmas, warm dense matter by introducing various laser technologies and novel targets. We will study hydrodynamics, energetic radiation and particle generation, nuclear reaction etc. in the extreme plasma. This research may reproduce the physical phenomena occurring in the interior of a star and/or around a high energy astronomical objects in a laboratory and understand its physical process by laboratory experiment. Figure: Span of plasma physics with high-intensity magnetic field. Figure: Generation of a photo-ionized plasma in a laboratory. Strong x-ray radiation around a compact object is mimicked by using a high-temperature and high-density plasma produced by high-power laser pulses. Details of atomic processes were studied with a photo-ionized plasma produced in our laboratory. Precise measurement technology development is necessary for precise experiments. Hard X-ray spectrometer using Compton scattering phenomenon, X-ray spectrometer using hard X-ray and photonuclear reaction of matter, radiography of high density plasma using X-ray pulse of about 1 picosecond, relativistic We are developing transport propagation measurement method using coherent synchrotron radiation from electrons, electromagnetic field measurement using laser accelerated proton, and so on. 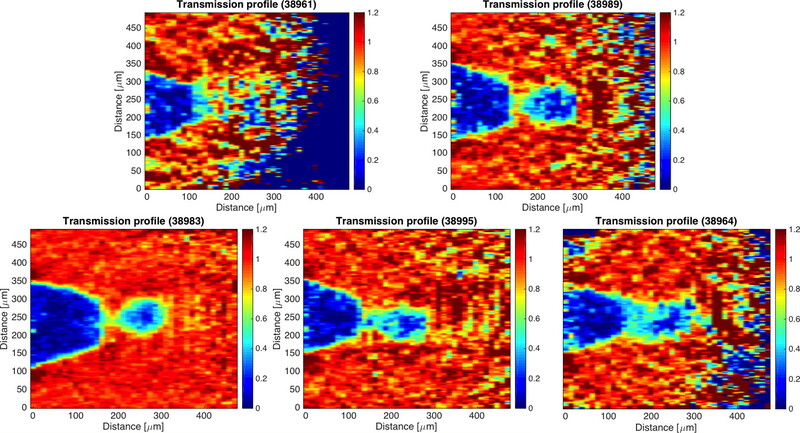 Figure: Electric and magnetic fields measurement with laser-accelerated proton beam.